More good events on the agenda this week. Please try to make at least one and spread the word. If you have a community and want to copy the calendar and paste it into your communications with them, please do (it would be nice if you'd credit couleeprogressives.org but not required). If your event is missing from this list, please use the form or email couleeprogressive at hotmail. THIS IS BANNED BOOKS WEEK! 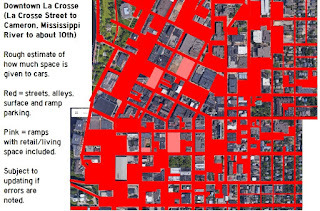 La Crosse Soup is a group that hosts a community dinner every three months or so (for $5 you get a bowl of soup and some bread) AND raises money for a community enhancement project (for your $5 you also get a vote). Ideas are pitched at the dinner and the idea that gains the most votes gets the money raised that evening. The next La Crosse soup is on October 10, but today is the deadline for pitch applications. So, check out their page and make your pitch. 4:00 p.m. Banned Books Week Family Read-In at the La Crosse Public Library South, 16th and Farnam. Pizza too. 5:00 p.m. The first of three training sessions for New Horizons advocates at First Baptist Church, 1209 Main. 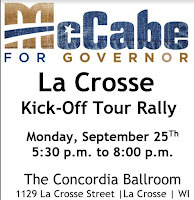 5:30 p.m. Mike McCabe for Governor Campaign Kick-Off at the Concordia Ballroom (1129 La Crosse Street) featuring the candidate himself. 7:30 p.m. Alt Truth Project presents Alabama Story at the Pump House. Race, rabbits, and reactionaries just in time for Banned Books Week. 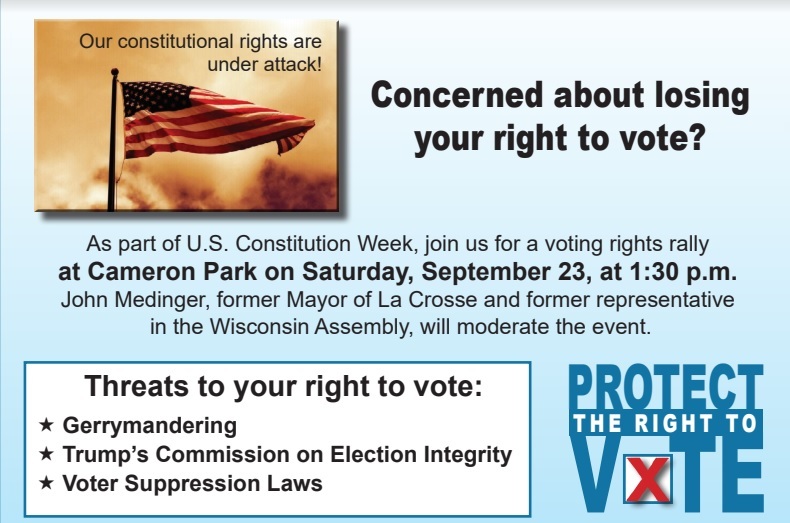 10 a.m. to 2 p.m. League of Women Voters voter registration at the Main Public Library (8th and Main) Info about how to find out what's on your ballot and how to register if you don't have a Wisconsin driver's license or ID will also be available. 4 to 6 p.m. League of Women Voters voter registration at the South Community Library (16th and Farnam). Info about how to find out what's on your ballot and how to register if you don't have a Wisconsin driver's license or ID will also be available. 7:00 p.m. FILM: Forbidden, Undocumented and Queer in Rural America - part of UWL's Hispanic Heritage month programming - at the movie theater in the UWL Student Union. 2:00 p.m. Medicare For All - a community conversation hosted by the Vernon County Democratic Party at the American Legion Hall (120 N Rusk) in Viroqua Come learn what you can do. A public conversation about replacing our complex and unfair system for a single-payer, improved Medicare For All with savings for people, business and the US economy. The speaker will be Dr. Melissa Stiles, Wisconsin Physicians for a National Health Plan leader and Professor of Family Medicine at UW Madison. Various local health care providers will facilitate an open forum with Q&A and discussion time. There will be an opportunity for action -tools and information on how to continue the movement for single-payer healthcare. If you have ever wondered why you should get involved, please read this real life story that happened right here in our community where an outcome was changed for the better because of the action of one individual. Not every story will have such a happy ending, but we each have history, knowledge, experience, energy, enthusiasm, passion that might be the exact puzzle piece that completes the picture of a good outcome. These important events are seeking a host! Citizen Action is looking for someone to FIND A LOCATION AND HELP WITH PUBLICITY for a Health Care for All forum in the La Crosse area. They will provide speakers and support. If you can help, contact Katie Dunn at Citizen Action. ACLU PeoplePower is seeking someone locally to help set up a Let the People Vote! launch party on Sunday evening October 1 to kick off a national campaign to make sure people can register, get to polls, vote, and have their vote count! If you have a big home or access to a community room or church space, please do it! Sign up to host at the link above and then email us so we can help get the word out. Just a reminder about Saturday's rally in Cameron Park. Following the rally, you can move to the Brickhouse just across the street to talk to Democratic gubernatorial candidates and their representatives about their campaigns. Here is a great overview and description of why this is so important by Prof. Mike Smukstra, Viterbo University (retired), one of the speakers. In early October, the Supreme Court of the US will hear a case to decide whether or not the hyper-partisan gerrymandering practiced in secret using high tech software allowing them to literally pick their own voters (and disenfranchise majority Democratic voters) is legal or not. One of the plaintiffs will be a featured speaker. This June 2017 Time Magazine article, Why Wisconsin is Not a Democracy, explains the issue well. This Journal-Sentinel article from 2012 digs into the details: Lawmakers were made to pledge secrecy over redistricting. The Pence-Kobach Commission on Election Integrity has drawn criticism and scorn since its inception. Beginning with a frightening demand that states turn over private voter data to the panel and continuing to the ethically challenged Kris Kobach's decision to illegally use his private email account for his committee work, they daily demonstrate their disregard for the laws and their single minded goal - disenfranchising as many voters as possible. Voter suppression laws, like Wisconsin's extreme voter ID requirements, are another part of the Republican - permanent minority rule - strategy. Earlier this year, a Nation magazine analysis concluded that Wisconsin's voter rules may have kept 200,000 eligible voters from casting ballots in the 2016 presidential election. Voter ID, dropping people from the voter registration rolls, limiting or eliminating opportunities for absentee voting, making it more difficult to register ... all these methods have been systematically rolled out across the country. This article chronicles the role ALEC and other right-wing organizations have had in making it harder for people to vote. (Voter Suppression 101 from The Center for American Progress). These three issues will be addressed at the rally, but there are others. Disenfranchisement of felons: The Sentencing Project notes that, "1 of every 13 African Americans has lost their voting rights due to felony disenfranchisement versus 1 of every 56 non-black voters." More than six million people who have served and completed sentences are now ineligible to vote. A 2014 Democracy Now! report (Jim Crow Returns: Interstate 'Crosscheck' Program Could Strip Millions of the Right to Vote) details how states' Republican Secretaries of State, using a Republican computer program, knock eligible voters from the voting lists when their names and/or personal information appear to be similar to data from felons, often in other states. Hacking of voting machines: Long before the Russians got involved, computer scientists warned that electronic voting machines, many owned by Republican consultants, were insecure and could be hacked. 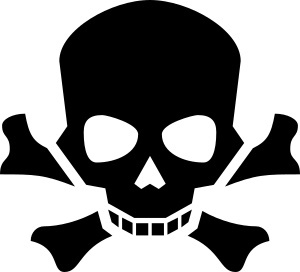 Black Box Voting, an organization founded in 2003, has long documented and warned of problems. The 2008 Emmy nominated HBO documentary Hacking Democracy follows them as they prove currently used machines can be hacked (reducing at least one election official to tears). And this summer at DefCon, an annual hacker convention in Las Vegas, many breaches and vulnerabilities were demonstrated. Closing/Moving polling places: Remember those heartbreaking videos of voters waiting five, six, seven, eight hours to vote in 2008 and 2012? It's still happening and, as this Atlantic magazine article notes, it's not a fluke, it's by partisan design. (No One in America Should Have to Wait Seven Hours to Vote). It's still happening. Polling places close, voting machines or other equipment and supplies don't work or aren't there, poll workers show up late. The Nation magazine, last November, noted that, There are 868 Fewer Places to Vote in 2016 Because the Supreme Court Gutted the Voting Rights Act. 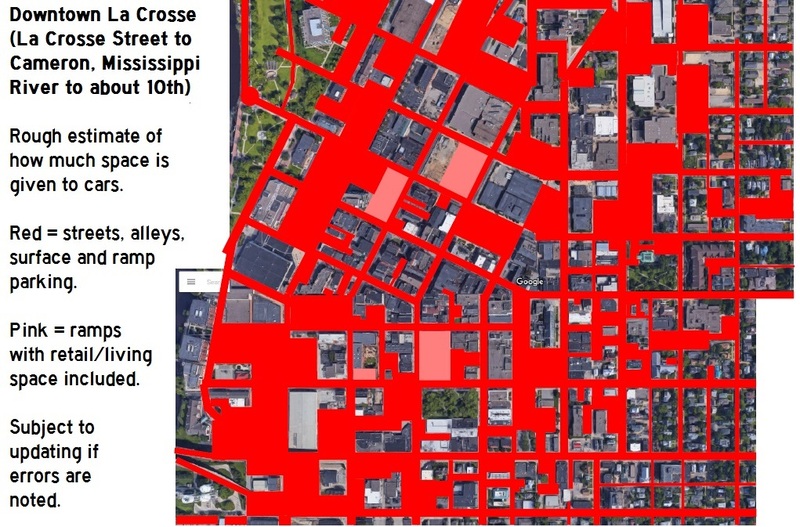 Even in La Crosse, 2016 redistricting has made some polling places very inconvenient for many voters (including many low income and elderly voters) with some polling places located outside the district they are to serve. There are glimmers of hope. The Supreme Court will hear mathematical evidence of the undemocratic outcomes of the Wisconsin gerrymandering and may use this as a precedent-setting case to strike down hyper-partisan gerrymandering. The involvement of Russian hackers in the 2016 election (including Wisconsin's election*) may shine more light on the problems of hackable voting equipment. But with the Department of Justice, House, Senate, White House and Supreme Court under the control of extreme right wing Republicans, there is a steep hill to climb. *Some might argue that the Jill Stein requested and paid for Wisconsin recount of the 2016 election proved that there was nothing wrong with Wisconsin's vote. In La Crosse and other counties where paper ballots could be and were individually hand counted, outcomes were actually verified by the recount. But remember that a hand recount of the whole state was denied by a Dane county judge allowing some counties to "recount" by simply rerunning ballots through machines. "Stein’s campaign has argued that if voting machines were tampered with, using those same machines to re-tabulate the votes “risks tainting the recount process.” It's interesting to note today, now that Wisconsin and 20 other states have been notified their voting systems were hacked, that the judge's ruling against a hand recount was based on her opinion that Stein failed to show that using machines to conduct a recount would likely produce incorrect results and that there’s a “substantial probability” that recounting the ballots by hand or another method will produce a more correct result — and change the outcome of the election. RED ALERT! Call your senators to oppose the new and even much worse Trumpcare bill (Graham-Cassidy) heading for a vote, without a CBO score or public hearings, very soon. Indivisible has a guide with background info and scripts. Call both Senators - there's a script for Rs and for Ds. This bill is awful. Two candidates for Wisconsin Supreme Court attended and spoke at Monday evening's La Crosse County Democratic Party meeting. Madison attorney, Tim Burns, talked about his humble roots, his background as an attorney taking on big insurance companies and his desire to represent fairness for all citizens as a Supreme Court judge. Rebecca Dallet is a Milwaukee county judge who was a Milwaukee county assistant district attorney and a special assistant United States attorney before that. Both talked about their backgrounds and values and some challenges they see in the current supreme court. One issue both talked about was the need for an improved recusal policy. Others agree which is why Common Cause Wisconsin is partnering with the League of Women Voters of Wisconsin to hold three public hearings around the state on the need for stronger recusal rules. (Unfortunately, Common Cause apparently believes that Wisconsin's western border ends at Madison since none of the three hearings are scheduled west of that city). 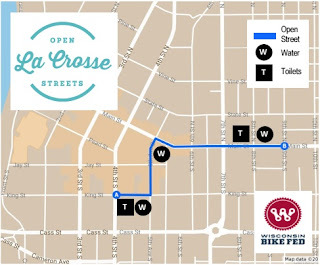 If you can attend the October 24 Madison event (or the October 2 event in Green Bay or October 11 in Milwaukee), please do. 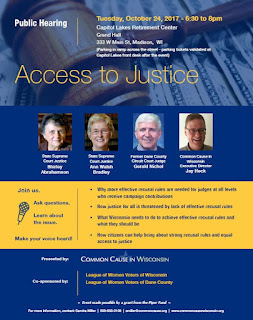 OR better, if you are connected to Common Cause Wisconsin and/or LWV, please lobby those groups to hold a fourth hearing in La Crosse. The sad reality is that "care one whit about the state's supreme court races or the court's recusal rules" is probably near the bottom of most voters' list of things they want to spend time on. A determined and well-organized right wing took over our state court after a decade of big dark money, questionable campaign ads, recount shenanigans, and low voter turnout. Somebody needs to start caring about this stuff. We think this issue is far too important to simply be swept under the rug and forgotten. 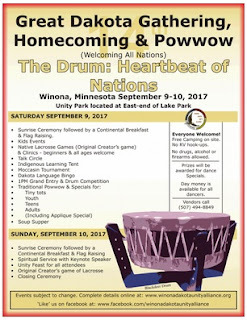 Therefore, Common Cause in Wisconsin has organized three "public hearings" on the issue to occur in October. On October 2nd, we will be in Green Bay and on October 11th in Milwaukee. Finally, we will hold a public hearing on October 24th in Madison, where two current Wisconsin Supreme Court Justices will talk about why more effective recusal rules are essential. spread the word about events, please do. If you can organize an event, please do. If your event is not listed here, please submit it using the form or by email. 6:00 p.m. Holy Trinity-Longfellow Neighborhood Association monthly meeting at Trinity Lutheran Church. 6:30 p.m. La Crosse County Democrats meet at the Ho-Chunk House (8th & Main) Speakers will be Wisconsin Supreme Court candidates Tim Burns and Rebecca Dallet. Once again, if you are not a member of the party, now is the time to join. This is the party that will probably generate the candidates we will work and vote for. If you want a say in who those candidates are (or even if YOU will be one of them) and what their priorities will be, then you need to join and have a say. Because otherwise, you are leaving the most important decisions to others. 2:00 p.m. New Role, New Me? : The Challenge of Identity Transititions, a TEDxUWLaCrosse event in room 150 Murphy Library, UWL. 6:45 p.m. Powell-Poage-Hamilton Neighborhood Association monthly meeting at the Southside Neighborhood Center. 10:00 a.m. Humanitarian Openstreets Team Mapathon to map vulnerable regions affected by natural disasters. Bring a laptop if you can. 245 Cowley Hall, UWL. 2:00 p.m. Fall Festival on the Farm to benefit GROW La Crosse at Deep Roots Community Farm, Cty Rd YY. Also, there will be a RALLY FOR MIKE MCCABE FOR GOVERNOR on Monday, September 25. If you can help with the event, please email lacrosse.for.mccabe-at-gmail. Let us know what's missing! This week - LOTS going on. Please use this form to send your event for the calendar or email couleeprogressive at hotmail. 7:00 p.m. Preview of Ken Burns' and Lynn Novick's documentaryVietnam at Weber Center with panel of vets following (you may be interested in reading this article from Counterpunch). Friday, September 15, 2017 at 7:00 p.m.
Robert M. “Fighting Bob” La Follette, founder of The Progressive magazine, promoted chautauquas to bring people together to raise hell and organize. Fighting Bob Fest continues this tradition. Donations accepted at the door and throughout the evening. Please join us after the Friday kick-off for TWO Saturday events! Oktoberfest structure at Copeland Park, 1130 Copeland Park Dr. Featuring local citizen activist panels on: enacting racial justice and protecting our water, land, and air, by building community power. More details on speakers and panels to come. Stay Tuned! Admission is FREE – Donations are very welcome. If you are interested in volunteering or your organization is interested in tabling at these events, contact info@ourwisconsinrev.com for details. 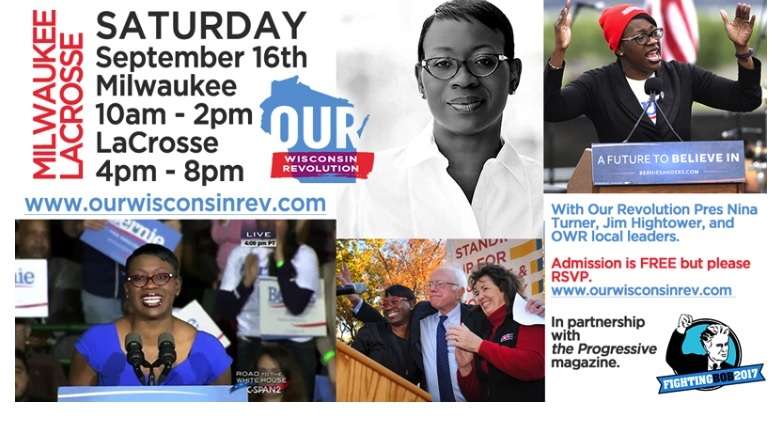 What Is Our Wisconsin Revolution? Our Wisconsin Revolution is an independent, member-driven and democratic organization that educates, agitates, organizes, and is working to elect thousands of everyday Wisconsinites in this state. We envision a real democracy, a fair economy, a clean environment, and an efficient and transparent government that works for the many not the few.